The key elements to successful care of the turfgrass are mowing, irrigation, aerating, fertilization and weed control. Fertilize every 4 to 6 weeks during the season. A slow release nitrogen fertilizer with a 4-1-2 or 4-1-3 ratio should work well. Remember, there are two types of grass being fertilized, bermudagrass (permanent) and perennial rye (seasonal). Areas in front of the mound and home plate circle, as well as just behind the infield arch may need high frequent fertilizer to help the grass repair in these high traffic areas. Spoon-feed any high use areas to keep the grass growing during the season. Post-emergent herbicides like Trimec Southern may be used to selectively control broadleaf weeds such as clover, dandelion, thistle and plantain without damaging the rye or bermudagrass. Pre-emergent herbicides may be used in February or March to keep warm season weeds from germinating. These weeds such as sandbur, crabgrass and goosegrass will try to invade the field in March, April and May. Are you having a problem keeping the high traffic areas on your softball and baseball field growing and strong throughout the season? 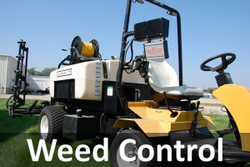 Are you constantly battling weed problems? Contact TMC at 1-800-292-1214. We are in the business of putting together solutions for sports fields all over Texas!